his is what i have so far. karim excelled in downhilll and four-cross with world cup wins in 1999 and 2004 in maribor and schladming . 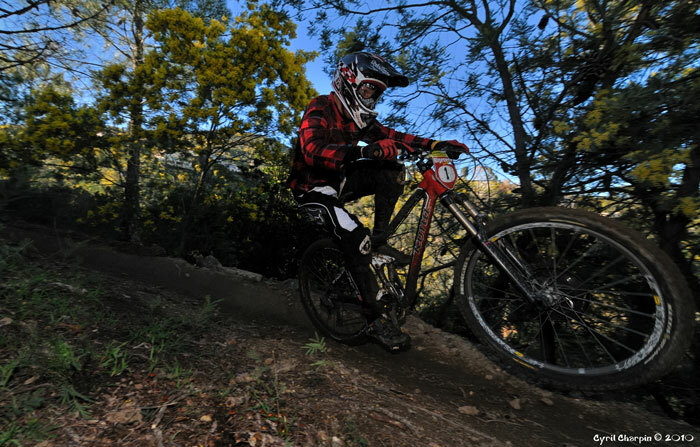 after a brief hiatus from racing returned with enduro racing. he was successful at this with wins in 2009 at the maxi avalanche in val thorens euro cup, winner of the maxi avalanche in are sweden, winner of the super enduro in sestri italy and winner of the rallly de sospel in france. 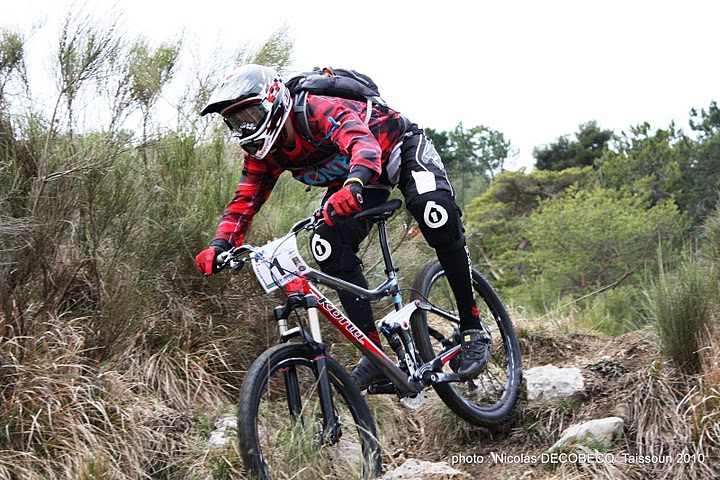 a couple 2nd place finishes in the enduro series of france and the maxi avalanche in andorra. he will also arrange for a few photo based magazine trips over the course of this season all on the cadabra. testing the magic link like it has never been tested before. 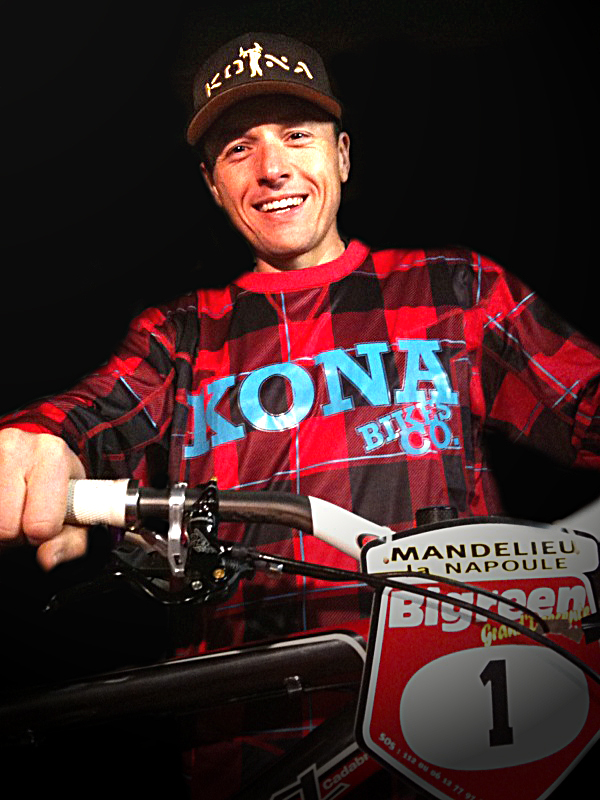 Kona recently signed one of Europe’s fastest super enduro riders. Based out of Nice, France, 35-year-old Karim Amour is off to a raging start on his Kona Cadabra, our brand new mega trail destroyer, able to climb like a banshee and descend like one too. Karim’s history of speed speaks for itself. He excelled in downhilll and four-cross with World Cup wins in 1999 and 2004 in Maribor and Schladming. He was french national four-cross champ in 2002. After a brief hiatus from racing he returned to enduro racing with a bang, winning last year’s Maxi Avalanche in Val Thorens, the Maxi Avalanche in Are, Sweden, the Super Enduro in Sestri, Italy, and the Rallly de Sospel, France. Not too shabby for a medium aged dude. On his new Kona Cadabra, Karim will compete at the Enduro Tour of France, the Maxi Avalanche Europe Cup (5 events), the Enduro Series of Europe (5 events), Megavalanche in Alpe d’huez, Downieville Classic, and Crankworx in Whistler. Karim will also be doing a number of photo based magazine trips over the course of this season, and as a whole, testing Kona’s revolutionary Magic Link platform like it has never been tested before. God’s speed Karim (although we don’t think you really need it).